The holding of the first meeting needs to be put in broader perspective. On November 3, Vietnam and Australia held the first iteration of a defense policy dialogue. The move is just the latest step that the two countries have been taking in strengthening their defense ties and building out its overall architecture, and its significance needs to be understood in terms of not just the bilateral relationship, but the broader region as well. Australia-Vietnam relations have been strengthening over the past decade or so, with ties elevated to the level of a comprehensive partnership in 2009 and then an enhanced comprehensive partnership in 2015, with a view to reach a strategic partnership in the future. Vietnam, as part of its broader omni-directional foreign policy, has sought to sign such partnerships with not just Western states like Australia or the United States, but also all five permanent members of the UN Security Council, other major powers like India and Japan, as well as other select influential states (See: “US-Vietnam Defense Relations: Problems and Prospects”). 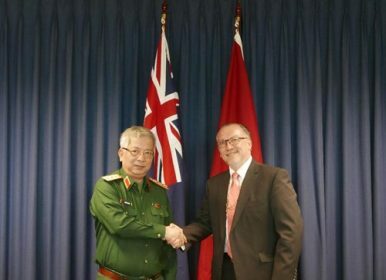 Vietnam-Australia defense cooperation more specifically began building out following the formalization of defense ties in 1999 and even more so after the inking of a memorandum of understanding (MOU) for defense cooperation concluded in November 2010. Over time, both countries have grown to engage in various forms of defense collaboration, with Canberra providing education and training to the Vietnamese military in areas such as English language and peacekeeping amid personnel exchanges and naval ship visits (See: “Vietnam Unveils New Port Facility for Foreign Warships in Cam Ranh”). The architecture of defense cooperation had begun to be built out in recent years as well over time. Indeed, in terms of dialogues, both sides have in fact already held bilateral defense meetings with their defense ministers, talks on defense cooperation between their senior officials, and a foreign affairs and defense strategic dialogue. The talks have covered a wide range of issues including progress on bilateral defense collaboration, regional and global issues of common interest such as transnational crimes, maritime security, and counterterrorism (See: “ASEAN’s Post-Marawi Islamic State Challenge”). This year, there have been several key visits and exchanges between the two countries, including that of Vice Chief of the Australian Defense Forces (ADF) Vice Admiral Ray Griggs in July and Australian Defense Minister Marise Payne in August, where issues such as peacekeeping, maritime security, and counterterrorism were discussed. Both sides also just held the fifth iteration of the foreign affairs and defense strategic dialogue in Canberra in September. Nonetheless, the holding of the first defense policy dialogue, as declared by Vietnam’s People’s Army Newspaper and covered in local media outlets, is significant. In terms of the bilateral defense relationship, the meeting, led by Deputy Defense Minister Nguyen Chi Vinh and Assistant Secretary of Defense Marc Oblong, marks yet another step in the institutionalization of those ties for both sides. Beyond the significance that this accords the relationship and the substance of what is discussed, as policymakers can attest to, the institutionalization process is itself important because it helps structure defense relationships in a complex web of ties among Asia-Pacific nations. The timing of the move is also not without significance in terms of the wider Australia-Vietnam relationship, beyond just the defense side. It gives momentum to ties just days before an anticipated meeting between Australian Prime Minister Malcolm Turnbull and Vietnamese Prime Minister Nguyen Xuan Phuc on the sidelines of the APEC Economic leaders’ Meeting in Danang. Both sides are expected to make inroads towards eventually upgrading the relationship to the level of a strategic partnership, as the two countries have pledged to do. That momentum will build into 2018, which is expected to carry its own significance for the relationship and the wider region. 2018 marks the 45th anniversary of the establishment of bilateral ties and the 20th anniversary of their bilateral defense ties. The anniversaries could be used by both sides to unveil new initiatives or make progress on existing ones, including on the defense side, where there already is ongoing work in areas like peacekeeping and there is future promise in others like cyber security or defense industrial cooperation. Australia is also set to host the ASEAN-Australia Special Summit Meeting in March, which will have a security aspect to it, while Vietnam will begin its deployment in a UN peacekeeping mission in South Sudan next year as well (See: “What’s Behind the First ASEAN-Australia Special Summit?“). The development needs to be understood from a wider regional perspective as well. With lingering uncertainty remaining over issues such as the South China Sea disputes (Vietnam is a claimant, and Australia an interested party) as well as on the future trajectory of a United States under President Donald Trump and a China led by a stronger, post-Party Congress Xi Jinping, not to mention other wider regional and global security challenges that will be addressed in several forums including the ASEAN-led meetings this year and next, it is promising to see two able Asia-Pacific nations forging closer cooperation to help address them (See: “What Did the ASEAN Defense Meetings in the Philippines Achieve?”). Though the refrain that no single country can address these challenges alone has become rather trite, it nonetheless has the benefit of being true.